A shocking attack on students has ignited Mexico and must spur us to action too | Amnesty International Canada. Nine days after the attacks against education students in Guerrero, 43 students are still missing. October 5th, 2014. Nine days after the grave human rights violations against the students of the Rural Teacher Training School of Ayotzinapa in the state of Guerrero by police forces of the municipality of Iguala, 43 students are still missing after being detained by members of the local police. The three levels of government of the Mexican state have not fulfilled their obligation in the immediate search for the disappeared with due process and according to international standards. Tlachinollan Centre, the Guerrero Network of Human Rights Organizations and the Human Rights Centre José Ma. Morelos y Pavón recognize the efforts by the parents of the disappeared students in initiating investigations regarding the disappearance of their loved ones. Yet, the reach of their efforts remains limited because they do not have the necessary resources. Official investigations continue to be ineffective because of the lack of intelligence work prior to the collection of the evidence in the crime scene and the absence of analysis of the information provided by arrested police officers and the pattern of the operations of organized crime in the region. Press release from FUNDEM May 2014. 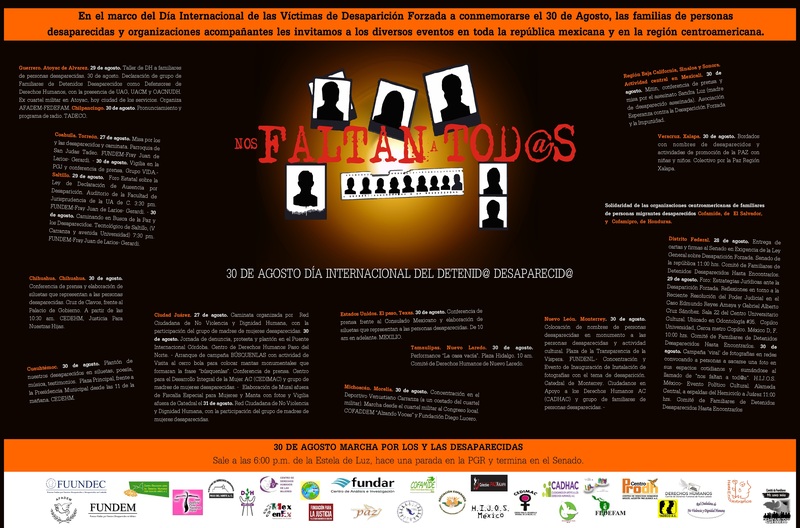 On February 2013, the Ministry of the Interior (Gobernación) presented a list with 26,121 people disappeared. On May 2014, the National Commission of Human Rights indicated to the Senate that 24,800 people were disappeared. In the same month, the State Attorney’s Office said that only 13,195 cases remained in the list of disappearances. Latter, the Ministry of the Interior said to the Senate that only 8,000 cases of disappearances that occurred during the past presidential administration remained unsolved. In addition, authorities continue to be silent about the number of disappearances taking place under the current presidential administration of Enrique Peña Nieto (2012-2018). The Senate did not even raise questions regarding the conflicting numbers presented by different government agencies, failing to fulfill its function of check-and-balances in human rights issues. Since 2011, FUNDEM has asked the federal government to create a National Registry of Disappeared Persons. Until today, the number of cases of disappearance remains unclear and the silence of state authorities regarding the methodology used to disclose such numbers adds to the already existing confusion. This raises the question: How many cases of disappearance is the government in fact investigating? Fuerzas Unidas Por Nuestros Desaparecidos en México.